Helgird is an elderly priestess working in Windhelm's Hall of the Dead. During the quest Blood on the Ice, her extensive knowledge on dead bodies will prove helpful when you investigate a series of killings in town. She leads a simple life tending to the dead and spends all of her mornings, from 7am to 3pm, wandering around in the graveyard outside the hall entrance, mumbling blessings to the tombstones. At all other times she will be inside the hall. She was supposed to sleep between 2am and 7am but doesn't, due to a bug. There are two exceptions to this routine: when Susanna the Wicked turns up in the graveyard as part of Blood on the Ice, she will be one of the three witnesses gathered around the corpse. During your investigation she will also act as a coroner and provide a bit of useful information. 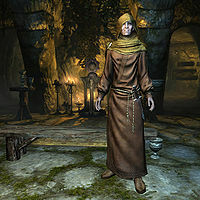 She wears hooded monk robes with a pair of boots. She carries an iron dagger and a selection of lower-class items and gold. When approached it becomes obvious she has spent too much time surrounded by the dead. Inside the Hall she will state: "This is the Hall of the Dead. Someday you'll end up here. ", "My job's simple enough. The dead don't really complain much." and "Luckily Windhelm is cold, so the dead don't rot as quickly. Sometimes the burial has to wait for the ground to thaw, though." When she visits the graves outside, she will prove much more faithful, while she pays her respects to the dead: "Mighty Arkay, I pray that you will shepherd these souls as they pass into the realm of death. ", "Mighty Arkay, God of Mortals, hear now the prayers of your humble servant. Bless these departed souls and welcome them into the realms beyond. ", "Lord of Seasons, I pray to you now that you might watch over the dead with mercy and kindness." and "Hear my prayer, son of Akatosh, and grant peace to these departed souls." 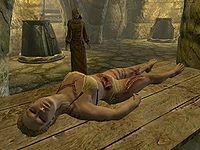 When the mutilated body of Susanna the Wicked turns up in the graveyard as part of the related quest, she will be one of the three witnesses gathered around the corpse. Questioning them will be your first objective and Helgird will greet you with a disturbed "This is a shame." However, even if she didn't see anything, she shares an interesting observation: "Eehhh... no. Sorry. But I did notice that her coinpurse was still intact, so whoever did this wasn't after gold. I'm going to keep preparing the body, if you'll excuse me." After Jorleif accepts that you investigate the murders, the guard in the graveyard will say: "Helgird's taken the body into the Hall of the Dead to prepare for burial. She's a little crazy, but if she knows anything, it's dead bodies." In the depths of the Hall, Helgird will be busy examining the mutilated body, repeating, "Large diagonal cut from left shoulder..." When you ask her if she has noticed anything strange about the body she will joke: "Well, she's dead. But I guess that's not unusual, at least not for somebody in here. I mean, someone who's not me, that is. Sorry, was only joking with you." You can either tell her to focus on the question at hand, which will make her wake up and say: "Oh, yes, right, of course!" or you can ask her if she found anything and she will say: "Not really." Regardless of your choice, she will continue: "The only unusual thing is the shape of the cuts. They look like they were made with... well, the ancient Nords used these kinds of curved blades when they embalmed their dead. I don't know who in Windhelm would even have something like that. Other than me, of course." If you imply she had anything to do with the murders, she will tell you off: "I'm too busy tending to the dead to spend my time making more of them. And I wouldn't very well tell you about the cuts if I had made them, now would I?" Another alternative is to just ask her to keep you posted which will net you: "I wouldn't hold out too much hope." After that, she will return to her work with: "Now, I really got to get back to the body. Lot of work to prepare her for the grave." After the quest Blood on the Ice her "Large diagonal cut from left shoulder..." dialogue will always take precedence. Helgird never sleeps, despite there being a bed for her in the Hall of the Dead. This page was last modified on 6 February 2019, at 22:08.